All youth Arrowmen in the Lodge are strongly encouraged to join a Committee. Ideally, Committees should have representation from all of the Lodge’s Chapters. Committees conduct the business of the Lodge. The Lodge Chief may assign other tasks that he deems necessary to a Committee. Responsible for all knowledge and training sessions and for spirit and competition preparation for Dixie Fellowship. Working with the Quest Event and Totem Pole Committee, the Planning Committee oversees all preparation for the Dixie Fellowship. Complete any other tasks deemed necessary by the Lodge Chief. Responsible for planning and leading service projects to be done at Fellowships, during Ordeals, and any other Lodge-wide days of service. Recruits participants and obtains materials for service projects with assistance from the Camp Ranger. Responsible for ensuring the Ordeal ceremonies, the Brotherhood ceremony, and any other ceremonies conducted by the Lodge comply with National policies and guidelines. Responsible for equipping each team with suitable and historically accurate outfitting with the assistance of the American Indian Activities Adviser. Responsible for forming teams to compete in ceremonies competitions at Dixie and NOAC. Plan and conduct Vigil Honor selection process. Complete petitions for Vigil nominations. Direct the Vigil Honor induction at the Fall Fellowship. Responsible for ensuring that the Ordeal and Brotherhood inductions comply with National policies and guidelines. Responsible for carrying out every aspect of Ordeals. Oversees recruitment of Elangomats and Nimats. Oversees Brotherhood questioning at Lodge events. Assists the Ceremonies Committee in preparing ceremonial grounds. Responsible for preparing the Lodge historical group dance team for competitions at Dixie and NOAC and any other performances where they will be representing the Lodge. Responsible for assisting individual dancers who wish to represent the Lodge at competitions or other events. Responsible for preparing the Lodge drum/sing team for competitions at Dixie and NOAC and any other performances where they will be representing the Lodge. Responsible for ensuring that all Chapters are conducting elections in compliance with National policies and guidelines. Ensures that all Chapters submit appropriate paperwork regarding elections. Oversees promotion of the Unit of Excellence Award. Provides guidance to Troop Representatives in the Blue Ridge Council. Responsible for notifying Brotherhood eligible Ordeal members of the Lodge of their eligibility to seal their membership. Responsible for assisting the Inductions Committee with Brotherhood questioning. 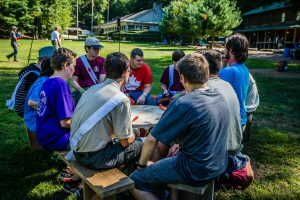 Working with the Lodge Secretary and Vice Chief of Inductions, the Brotherhood Committee encourages inactive Arrowmen to renew membership and to participate in Lodge activities. Oversees the Lodge’s Quest for Brotherhood program and “Get Your Bars!” campaign. Responsible for promoting camping and Camp Old Indian in troops within the Blue Ridge Council. Reaches out to the Blue Ridge Council Camping Committee for guidance. Ensures that Troop Representatives in the Blue Ridge Council are routinely promoting Camp Old Indian and other camping opportunities. Responsible for maintaining the historical records of the Lodge. Ensures that the Lodge History Book, Planbook, and website historical records are kept updated and revised routinely. Assists in the assembly of the latest edition of the Lodge’s Patch and Memorabilia Guide. Oversees development and routine updates of the Lodge website, various social media accounts, and shall assist with any technology utilized at Lodge events if necessary. Works with the Vice Chief of Communications to publish a Planbook, issues of the Little Carpenter, and any other publications deemed necessary by the Vice Chief of Communications. Oversees the design of Lodge merchandise items to be presented for approval at Executive Committee Meetings. Oversees the design of the upcoming year’s event patch set to be presented for approval at the Fall Fellowship Executive Committee Meeting. Oversees Quest events run by Chapters at Fellowships. Ensures complete preparation for the Quest for the Golden Arrow competitions at the Dixie Fellowship. Oversees preparation of a totem pole carving team that will compete at the Dixie Fellowship.